Ever since we went to Vatan for dinner last month, I have been craving Buttermilk and Spinach Soup or Kadhi (The Lazy Man's Buffet). This 'soup' is famous all over India but more so in North India and can be made in different ways. I love the way my mom makes it because it can be eaten by itself or with plain rice and papad, plus it is healthy. I'm always trying to eat better but without subtracting the Taste. If you are like me, you don't have to worry about it with this recipe. It has plenty of taste. So my dad and I are going to make this soup and rice so when my mom returns from her trip to India today, she will have something warm to eat. I have the recipe that she left me in case I wanted to make. 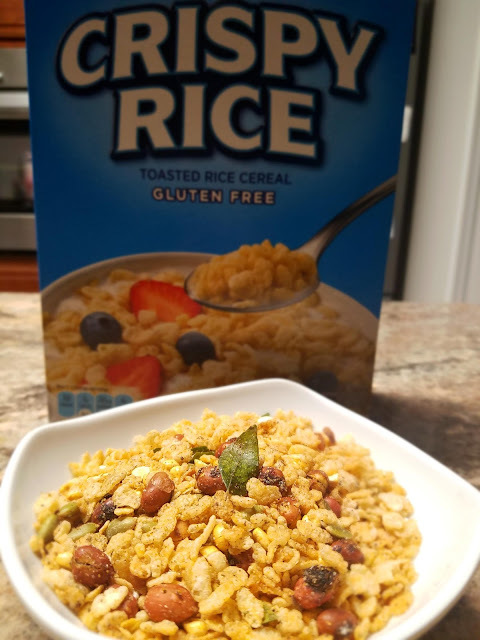 If you want to try this at home, please keep in mind this recipe makes 6 servings (1 cup/serving). 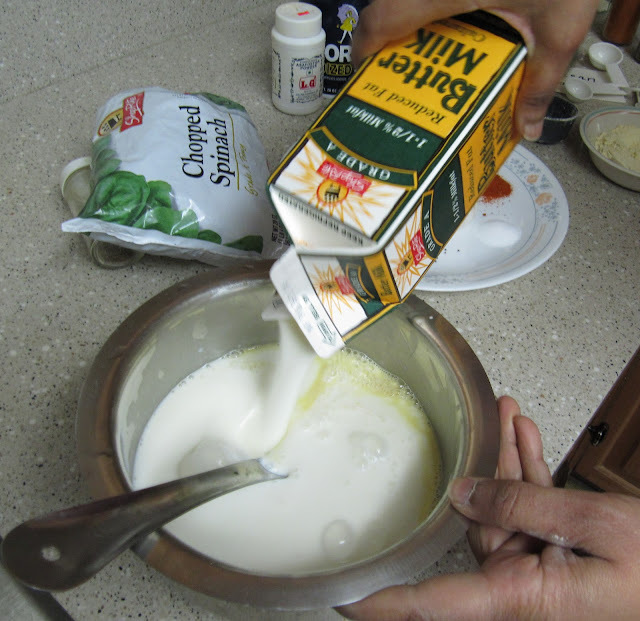 2) Add buttermilk and mix well. 3) Microwave the potatoes for 5-6 minutes until cooked and soak them in water to stop cooking. Remove the peel, cut into 1-inch cubes, and set aside. 4) To the mixture add spinach, potato cubes, ginger, turmeric powder, and chili powder and then mix again. 5) Bring the soup to a boil on Medium Heat and continue mixing intermittently. Next reduce to low/medium heat and then boil it for another 4-5 minutes. 6) Remove from stove, add salt and again mix well. Please put aside for now. 7) To make the seasoning, add oil in a small sauce pan, and heat it on medium. When heat is felt to the palm held over the pan, add mustard and cumin seeds, and then allow them to splutter. Immediately, add garlic and fry for 2 minutes or until golden. Remove from stove and add Hing powder and curry leaves. Mix it well and pour it over the soup. 8) Serve 1 cup hot soup over 1/2 cup cooked plain rice and enjoy it with crunchy papad or even potato chips. For added taste, add a teaspoon of ghee (melted butter) to the serving. Papad can be toasted in the microwave for 30-40 seconds depending on size. - Please note this soup can be made with either spinach or potato or both of them. Use 2-1/2 cups of spinach or 4 to 5 medium potatoes for 6 servings when used individually. - You can use whole milk yogurt instead of buttermilk as well. - If you want to eat the kadhi like soup use 1/3 cup besan; otherwise use 1/4 cup if you want to eat with rice.